I'm starting to notice a pattern here. I post only on Saturdays. Saturdays are my tiny pieces of peace in my busy weeks. I like to catch up on my favorite TV shows and favorite blogs. Laundry is not all the peaceful, but it's a necessity. I'm sore and tired today from working at my Company's Employee Club's Ladies Shrimp Boil last night. This is my first year on the board and my first event as organizer. I now can see just how much planning and sweat goes into an Employee Club event...something you can't possibly know or understand by just being an attendee. Overall, it was fun. And the ladies seemed to have a great time eating, drinking, visiting, and playing Bunko. I thought the size of the building was going to be an issue because the response this year was overwhelming. Thankfully, the building ended up working, and we had enough room. With so many people, however, the air conditioner couldn't keep up, and the temperature was a warm 79 or 80 degrees most of the evening. There were a few complaints about the heat, but once Bunko commenced and door prizes started being handed out, no one seemed to mind. I know now what areas were successful and what areas need to be focused on more next year. It's unfortunate that some seem to not have a functioning self-edit button. While some were kind and appreciative with their comments, even staying to help clean up; some were not only unappreciative but were equally negative and rude. Being a people-pleaser makes me want to work even harder next year so that there are no rude comments and that not one person will have even one thing to complain about. But in reality, I realize that when organizing a function for 100+ people, not to mention that these 100+ people are women, having zero complaints will be almost positively impossible. I will never be able to please everyone, but this chicky will get it her best shot. I'm about to finish up Week 2 of Nutrition Boot Camp in Cracking the Fat-Loss Code. I'm pleased with the plan so far, and I'm looking forward to Week 3. I've lost 9 pounds since starting the plan. I have noticed an increase in my energy level. And I feel really good!!! My only complaint of the plan so far is the variety. I found myself getting bored with the food choices this past week, but I think part of that is my fault. I failed to have enough food on hand, and I know I need to do some research for next week's menu items. It's all about planning ahead. Today was the first day since beginning the plan that fruit is on my menu. I enjoyed my strawberries, grapes, and cottage cheese breakfast. Today is my first Carb Up day, so Keith is taking me out to our favorite Mexican restaurant. I am looking forward to having a few chips and dip. I had an exciting appointment this week, and I think a door may have cracked opened. I wish I could say more, but at this point, I can't! Just say a prayer for us that the door opens even wider. 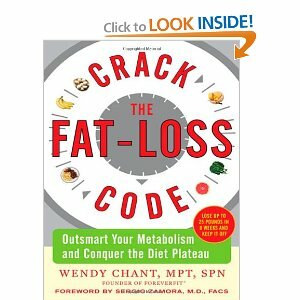 I bought a book a couple of weeks ago entitled "Crack the Fat-Loss Code" by Wendi Chant, MPT, SPN, and certified personal trainer and body builder. Basically, she lays out an eight week plan designed to reprogram your body so that it learns to burn fat and keep it off. I'm someone who has gained and lost many pounds, so this book intrigued me. If I set my mind to a plan and a goal, I can normally lose. But I always reach a point where the scale stops going down. There are certain foods I'm not willing to live the rest of my life without. And if a particular program restricts such foods, I inevitably reach for them again and thus gain the weight back. It's a vicious cycle. I first heard about the "Wendi" program while attending Weight Watchers a few years ago on a weight loss message board. It is a good way to boost your weight loss when you hit a plateau. I'm two days away from completing Cycle 1 - Carb Depleting Week. Although I wondered at times if I would be able to make it, it hasn't been unbearable. I have a massive sweet tooth, and I love breads and pasta. The first two days were the worst. I craved sweets, especially in the evening. But each day became easier. And when I stepped on the scales yesterday, I was pleasantly surprised to see six pounds gone. I've noticed my energy level is higher than normal (even though I'm still in bed on Saturday morning at 10 drinking coffee and blogging.) The biggest challenge for me this week has been breakfast. I don't like eggs. I tried eating scrambled egg whites on Days One and Two, but I couldn't make myself take more than two or three bites. I stopped trying on Day Three and instead drank a Protein Shake for breakfast the rest of the week. Monday begins Cycle 2 - Macro-Patterning, which is a 3-week cycle. During the first week, carbs are slowly re-introduced and at only certain times of the day. I'm worried. I'm a junkie when it comes to carbs and sweets. Will the moderation only lead to me wanting more and more? We shall see. I'm posting a link to the book and a review of the plan. I can't believe it's June! Where does the time go? Wasn't it just winter? Here we are again in the midst of another hot and humid South Arkansas summer. Keith and I made a short trip to Dallas this weekend to do some shopping for my step-son's room. It was nice to go without an agenda of poking, nurses, exams, bloodwork, etc. looming. Just to go and enjoy was nice. The trip was a success, and we came home with alot. My step-son just turned 13 in April and since then, he's been having some issues with school. Kids are nothing like they were when my husband and I were growing up. He's not making very wise choices right now, and we are all having trouble understanding why. He knows what is right and wrong. It looks like he may be coming to live with us. The role of step-mom is a daunting one at times. I know from growing up with a step-mother how important it is to know my place in his life. The line there is a sensitive one. Do too much, and you're invading Mom territory. Do too little, and you're uninvolved and labeled as uncaring and unwelcoming. I love J alot. While I'm excited about the thought of him living here, I'm scared. Of what, it's hard to put in to words. And too many things wrapped up all into one. Keith and I agree this change is something he desperately needs right now. Funny how we chose his room to work on first and complete. Funny how it's almost finished....and just in time. Funny how we arrived at the decision to finish the house before trying for a baby again. Looking back over the year, it is amazing to see God's plan unfold in our lives. The Plan is always unfolding, even when we're not aware. His calendar is not aligned with mine. It makes me think... why bother to keep one? Baby news......we've been researching all of our options, and we're excited about alot of what we've found. I've been exchanging e-mails with our fertility clinic in Dallas, and we're keeping all options open. Right now, our main focus is on our house and getting that part of our lives behind us. Oh, how trying it can be! Everyday life doesn't stop so I can go prep walls to paint. Laundry still piles up. We still have to eat. And we still want a baby. Despite how trying a house remodel can be, I do feel like I am at a neat place right now. I'm unbelievably content. And content is nice. There is an excitement...an expectancy of some sort....like something truly unexpected and wonderful is around the corner. I've been enjoying our life together more than ever. K and I have been laughing alot, enjoying our home, and just being together. I've also made a decision to stop resenting pregnancy announcements. Somebody pops up pregnant what seems like everyday. Pregnancy is a miracle for any woman, whether or not they realize that or not. This has been a big deal for me in the past. And it has been a heavy weight to my spirit. I decided to lay that burden down. My thoughts and prayers are with several of my dear blog friends today.....those going thru another round of IVF, those making preparations to bring their new baby home through adoption, and then those who are still waiting like me. Much love and hugs to all of you.